Chris Oglesby, author of "Fire in the Water, Earth in the Air: Legends of West Texas Music," has been recognized by the Association for Recorded Sound Collections Award for "Excellence in Historical Recorded Sound Research". The awards are presented to authors and publishers of books, articles, liner notes, and monographs, to recognize outstanding published research in the field of recorded sound. In giving these awards, ARSC recognizes outstanding contributions, encourages high standards, and promotes awareness of superior works. A maximum of two awards is presented annually in each category-one for best history and one for best discography. Certificates of Merit are presented to runners-up of exceptionally high quality. The 2007 Awards for Excellence honor works published in 2006. Oglesby was awarded the certificate of merit in the category "BEST RESEARCH IN RECORDED POPULAR MUSIC." 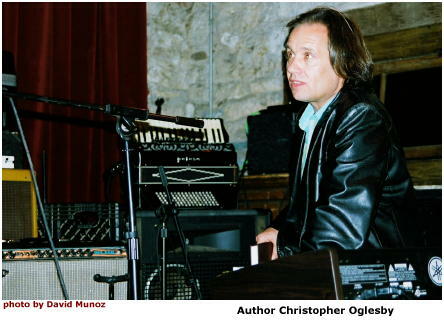 Virtualubbock is author Chris Oglesby. In 1998 writer and long-time Lubbock denizen Christopher Oglesby embarked on a literary project called "Fire in the Water, Earth in the Air: Legends of West Texas Music", an attempt to answer the question: "Why are there so many remarkable, innovative artists from Lubbock, Texas?" Since March 15, 2000, virtualubbock.com has been Oglesby's vehicle in his quest to understand the mythology of his hometown. Chris Oglesby was reared and educated in Lubbock, Texas for 24 years. He graduated from Lubbock High School, and received his bachelor of arts and doctor of jurisprudence degrees from Texas Tech. His father was a coach at Texas Tech University, where his mother taught English. Chris has spent the better part of the last twenty years telling the world, person by person, face to face, how cool Lubbock really is. Now, virtualubbock.com proves it to the world! READ a review of "Fire in the Water, Earth in the Air"